Born 11 Jun 1912; died 2 May 1997 at age 84. Born 11 Jun 1886; died 21 Aug 1960 at age 74. American engineer whose studies of airflow and wind velocity helped make possible the design of aerodynamically stable bridges. Steinman's thesis for his Ph.D. from Colombia University (1911) was published as "The Design of the Henry Hudson Memorial Bridge as a Steel Arch, and more than 20 years later he built the bridge he had planned over the Harlem River. Steinman designed more than 400 bridges, for instance Sidney Harbor Bridge in Australia, Mackinac Straits Bridge, Carquinez Strait Bridge, San Francisco (1937), Saint Johns Bridge, Portland, Ore, Deer Isle Bridge, Maine, Mount Hope Bridge, Rhode Island. Alfred Louis Kroeber was an American anthropologist who was influential in the first half of the 20th century. His primary concern was to understand the nature of culture and its processes. He graduated from Columbia University in 1896, and received a Ph.D. under Franz Boas there in 1901, then moved west to found the anthropology department at the University of California at Berkeley where he remained until 1946. His chief scholarly interest was California Indians. He developed the concept of cultures as patterned wholes, each with its own style, and each undergoing a growth process analogous to that of a biological organism. Kroeber also made valuable contributions to the archaeology of New Mexico, Mexico, and Peru. Alfred Kroeber, by Julian H. Steward. - book suggestion. Born 11 Jun 1867; died 11 Dec 1945 at age 78. Born 11 Jun 1860; died 4 Apr 1943 at age 82. American marine zoologist known for establishing the basic taxonomic information on Crustacea. For many years she was the Smithsonian's complete department of marine invertebrates where she studied, cataloged, and preserved specimens. Through her basic studies and published works, she fixed the nomenclature of Crustacea and was the recognized, and the much sought after, authority in zoology and carcinology (thestudy of crustacea). When the department needed an assistant, she resigned as superintendent and used her salary to hire someone. She continued to work without pay as a dedicated volunteer carcinologist. She published over 160 papers on a wide variety of scientific subjects.Image: Blue crab, Callinectes sapidus, named by Rathbun. Born 11 Jun 1857; died 1 May 1950 at age 92. American entomologist noted for pioneering efforts in applied entomology and his experiments in the biological control of harmful insects. He is regarded as the founder of agricultural and medical entomology. He proposed that natural enemies rather than pesticides be used for controlling pests. Howard was head of the U.S. Dept. of Agriculture for over 30 years. He described 20 new species of mosquitoes, and 47 new groups of parasitic wasps. Howard revealed that houseflies carry and transmit many diseases. He was the first to suggest covering standing water with oil to control egg-laying by mosquitoes and kill larvae to reduce disease transmission. His work led to belief that great natural balances are mainly due to the action of the parasites. Born 11 Jun 1842; died 16 Nov 1934 at age 92. German chemist, engineer and inventor who invented mechanical refrigeration. His first refrigeration equipment was tested in a Munich brewery. Brewing good lager beer required low temperatures, limiting brewing to winter, or in deep cellars with the use of large quantities of block ice. Through Linde's invention of refrigeration, beer brewing became seasonally independent. Linde also invented a continuous process of liquefying gases in large quantities which provided both impetus and means for conducting scientific research at low temperatures and very high vacuums. Linde's original industry has now grown to 120 companies around the world. Born 11 Jun 1829; died 7 Jun 1907 at age 77. Born 11 Jun 1824; died 28 Feb 1907 at age 82. Died 11 Jun 1963 at age 77 (born 29 Oct 1885). Died 11 Jun 1937 at age 42 (born 20 May 1895). Died 11 Jun 1936 at age 58 (born 14 Feb 1878). Died 11 Jun 1931 at age 76 (born 23 Mar 1855). American sociologist, one of the first in the United States to turn sociology from a branch of philosophy into a research science dependent on statistics. He was noted for his doctrine of the "consciousness of kind," which he derived from Adam Smith's conception of "sympathy," or shared moral reactions. His explanation of social phenomena was based this doctrine - his theory that each person has an innate sense of belonging to particular social groups. He encouraged statistical studies in sociology. Died 11 Jun 1895 at age 80 (born 27 Sep 1814). American astronomer and mathematician who noted in about 1860 that there were several zones of low density in the minor-planet population. These gaps in the distribution of asteroid distances from the Sun are now known as Kirkwood gaps. He explained the gaps as resulting from perturbations by Jupiter. An object that revolved in one of the gaps would be disturbed regularly by the planet’s gravitational pull and eventually would be moved to another orbit. Thus gaps appeared in the distribution of asteroids where the orbital period of any small body present would be a simple fraction of that of Jupiter. Kirwood showed that a similar effect accounted for gaps in Saturns rings. Died 11 Jun 1743 at age 72 (born 10 May 1671). In 1998, scientists deciphered the last of the genetic material of bacterium that causes tuberculosis. 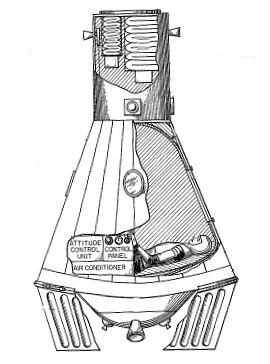 In 1963, the Mercury space capsule was patented by Faget, Meyer, Chilton, Blanchard, Kehlet, Hammack and Johnson (U.S. No. 3,093,346). It was assigned to NASA. The invention was described as a "manned capsule configuration capable of being launched into orbital flight and returned to the earth's surface." The invention was to provide "protection for its occupant from the deleterious effects of large pressure differentials, high temperatures, micrometerorite collisions, high level acoustical noise, and severe inertial and impact loads." The patent was applied for on 6 Oct 1959. Mercury 1 had already flown, on 5 May 1961, in a 15-min sub-orbital flight carrying Alan B. Shepard before the patent was issued. In 1928, the world's first rocket-propelled aircraft flight was made over the Rhon Mountains, Germany. It was a tailless glider with two solid-fuel rockets, pioneered and developed by Alexander Martin Lippisch. In 1901, Thomas A. Edison was granted a patent for a "Phonographic Recording Apparatus" (U.S. No. 676,225). In 1889, a folding chair was patented by black American inventors John E. Purdy and James R. Sadgwar of Washington, D.C. (U.S. No. 405,117). They described a design for a "cheap, strong and durable chair which is capable of being folded into small compass, so as to be easily portable. The invention consists in the peculiar manner of jointing or hinging the frame and in details of construction." Each leg had two sections hinged together. The seat could be canvas, carpet, or any such ordinary flexible material. "When folded, this chair makes a remarkable small and compact bundle... in very convenient form to be carried in a bag or shawl-strap... making a most convenient article for artists, tourists, &c."
In 1889, Thomas A. Edison was issued a patent for an "Electrical Distribution System" (U.S. No. 404,902). In 1793, Robert Haeterick of Pennsylvania was issued the first American patent for a stove design of cast iron. His name is spelled in various ways in the early records, including "Heterick." His patent was issued about three years after the very first U.S. patent, and like others of the period, it was not numbered. The original record of this patent was destroyed in the 1836 Patent Office fire. Most of the lost records were not reconstructed, and the full patents no longer exist in the Patent Office records. However, a list of titles and inventors was compiled from printed (usually annual) lists of patents which had been issued, and this list preserves some knowledge of the early patents.